An often overlooked but important role in any caregiving ecosystem is the role filled by family caregivers. innovative research, practical solutions, and rich collaboration. Atlas integrates advanced design techniques in all its work, combining an innovative, engaging approach with a human, empathetic touch. 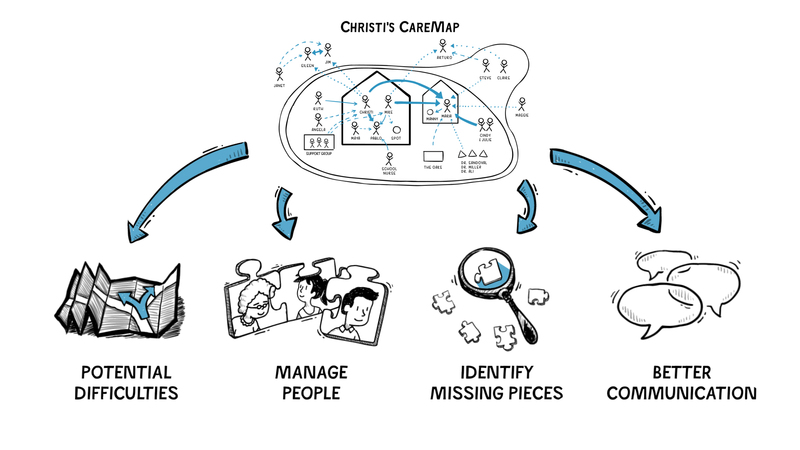 The CareMap tool emerged out of our original research in an effort to help family caregivers visualize their personal care ecosystem. This practical tool was developed to both empower caregivers with insights and to illustrate where a family caregiver’s own support system has sufficient resources and where there are gaps. These Atlas CareMaps may look complicated, but in reality they are deceptively simple. Anyone with a piece of paper and a pen can create their own Atlas CareMap and begin incorporating it into their lives. We are excited to share with you three short videos that will explain what an Atlas CareMap is. These animations were created by IdeaMachine at Whiteboard Animation. In the first video, we explain briefly what an Atlas CareMap is, how it is used and the benefits it can provide. In the second video, we break down the process of building the Atlas CareMap and provide instructions for how to build your own. In the third video, we provide examples of how you can use your CareMap to obtain the additional support that you need. The accompanying PDF is here. To watch and read in Spanish, click here.